And so the time has come for the second installment in our Georgette Heyer series this year. 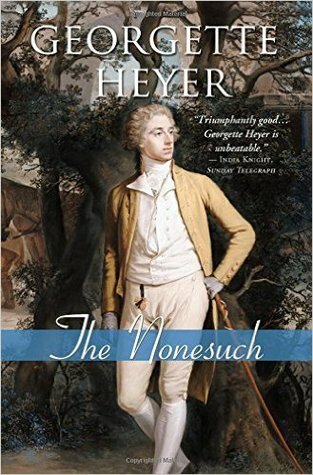 I moved almost immediately from The Convenient Marriage to The Nonesuch, which I borrowed from my trusty Beth's extensive Heyer shelf. I knew next to nothing about it, but loved the title and hoped (rather shallowly) that the titular character proved somewhat more lively than the man on the cover. Spoiler: he does, albeit in a somewhat restrained manner. As befits a paragon of his stature. Truly, the way the entire countryside rhapsodizes over this man. It's endlessly amusing. It's also a good thing he takes it all with a humongous grain of salt. And that Ancilla gives as good as she gets. The banter between the Nonesuch and Miss Trent (I categorically refuse to call him Waldo) is the unrivaled highlight of the novel. I was gratified we got a good deal more than we did in The Convenient Marriage. Although, Heyer's dialogue is so perfect, I will always wish for more. And while we're enumerating wishes, I will offer up my fervent wish that the entire production had not been so thoroughly railroaded by one Miss Tiffany Wield. She's appalling, everyone knows she is appalling (with the thankfully brief exception of Lindeth), and she gets entirely too much page time for my blood pressure. This was not meant to be her show, and I resented all the perfectly good courting time between the shelf-bound governess and the Nonesuch being swallowed up by her weaselly machinations. Fortunately, the Nonesuch, Ancilla, Lindeth, and lovely, lovely Patience are there to carry the day and ensure the Huge Misunderstanding didn't gather too much steam for my suspension of disbelief. "I don't dislike you. If—if you thought me stiff when we first met it was because I dislike the set you represent!" "I don't think you know anything about the set I represent," he responded coolly. "Let me assure you that it is very far removed from Mountsorrel's, ma'am!" "Of course—but you are—oh, the Nonesuch!" she said with a quick smile. "Mountsorrel and his friends copy you—as far as they are able—"
"I beg your pardon," he interrupted. "They don't—being unable! Dear me, I sound just like the Beautiful Miss Wield, don't I? Some of them copy the Corinthian rig—in the exaggerated form I don't affect; but my set, Miss Trent, is composed of men who were born with a natural aptitude for athletic sports. We do the thing." "A look of such piteous entreaty was cast at me—"
"No!" protested Miss Trent. "Not piteous! I didn't!" "Piteous!" said the Nonesuch remorselessly. "Your eyes, ma'am—as well you know! !—cried Help me! What could I do but respond to the appeal?" "Next you will say that it went much against the pluck with you!" said Miss Trent, justly incensed. "No service I could render you, ma'am, would go against the pluck!" Her colour mounted, but she said: "I should have guessed you would have a glib answer ready!" "You might also have guessed that I meant it." I do love a solid rejoinder. And any time Ancilla is "justly incensed." And in this second outing with Heyer, I definitely enjoyed our hero and heroine spending more actual "in-room" time together. Though I still bemoaned the lack of closeness beyond conversation. By the time he finally puts his arm around her. I SWEAR. That said, another proposal scene utterly nailed. This one of the devastating variety, sure, but still. Guys. Woman knows her way around a proposal scene. It was the saddest scene in the book and it remains my favorite—tightly written, taut with emotion, and so much left to be said. Sigh. On to the next! Will it be The Grand Sophy? Frederica? Devil's Cub? Who knows which way the reading winds will blow?